The script is practically identical to Shakespeare’s original, save a few abbreviated scenes substituted with some Shakespearean sonnets and stanzas from “A Mid-Summer Night’s Dream.” And the telling of the play itself is unique, specifically in its minimalism. Two boxes and a large chest are the only set pieces on the ground level stage, and the only significant prop utilized throughout the performance is a long silken-red strip of fabric. The actual telling of the play is done in the style one would expect tyrannized catholic high school boys would tell it: in lampoons and mockeries, sporadically sprinkled with bouts of horseplay; and in a highly unorthodox fashion, the players countenance intermittent laughter and sometimes momentarily step out of character, which engages the audience even more directly. As for the characters themselves, the portrayal is all teenage variety : Romeo is impetuous, lustful, and a little cocky, while Juliet is bashful, goofy, and compulsively histrionic. Scene transitions are purposefully clumsy and noisily announced by the boys as they quickly rearrange the boxes. Whenever a looming patriarchal figure “enters” the scene, such as Lord Capulet or the Prince of Verona, two or more of the boys will join hands on the red cloth and begin firing off lines in a intimidating tenor to symbolize the oppressive tactics patriarchs have used to scare society into submission since god knows when. The one scene that stands out the most is the secret wedding of Romeo and Juliet. As Romeo and Juliet try to recite their vows, the other two boys try to cover Romeo and Juliet’s ears and try to pull the two lovers away from one another. A little violence eventually ensues, as the life on the stage fades to soft whimpers. At that point, the players discard their ties and blazers and untuck their shirts one by one — just as they are casting off the shackles of gender expectations and society’s pieties. All told, the play left a lasting impression and brought me to muse on its parts as I walked in silence that afternoon through Center City. This entry was posted on Monday, August 25th, 2008	at 3:46 pm	and is filed under Culture	. You can follow any responses to this entry through the RSS 2.0	feed. You can leave a response, or trackback from your own site. Sounds like something I’d like to see. Any chance of it coming back since it’s over now? Are they traveling? Or a movie version ? Now that is “my kinda Shakespeare” too. The writer clearly understood the performance. The nuances were masterful, and it would take much space to itmize them. But the writer gave a wonderful sense of a wonderful play. Thanks! Good work. Thanks for the comment on Uwish. I have been doing some food stuff for them, I really enjoy it. 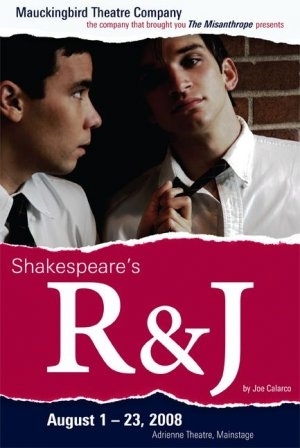 I reviewed R&J for them too. Great show. I’m loving your Phawker stuff. Great review! I saw the play, loved it, and I feel that Aaron Stella accurately dissected the parts that made up the whole. This was an unusual rendition of Shakespeare, to say the least, and the connect between Catholic repression and the desire of those Catholic school boys to throw off that repression via “A Mid-Summer Night’s Dream,” was perfectly made for anyone who saw this play. I’m still glad, however, that Aaron pointed this out for those who might have missed the point, since there were a number of people who wondered aloud at the full meaning of this play.